Elder is in full bloom in central California. It blooms from early spring and well into the summer at various elevations here. We harvest in the valley in early spring and into higher elevations as the season passes. Elder loves water and so we find it along creek beds. Some of the bushes have managed to grow with less water and we find that those bushes are likely to flower but the plants end up gasping for water before they put on berries. We eyeball those bushes for our flower harvest — our flower harvest doesn’t affect their berry production anyway because they are not likely to bear fruit. We pick the blooms not concerning ourselves that we have just over-harvested our summertime berries. I will admit that I bother mainly because I enjoy the hunt. In the case of elderflower, the flavor itself is not a memorable one. It’s mild with no particular distinct experience about it but I have noticed a difference in my son’s springtime health when he drinks it. Because it blooms in the spring, we have dabbled with it for spring allergy relief and did find that it does help him. 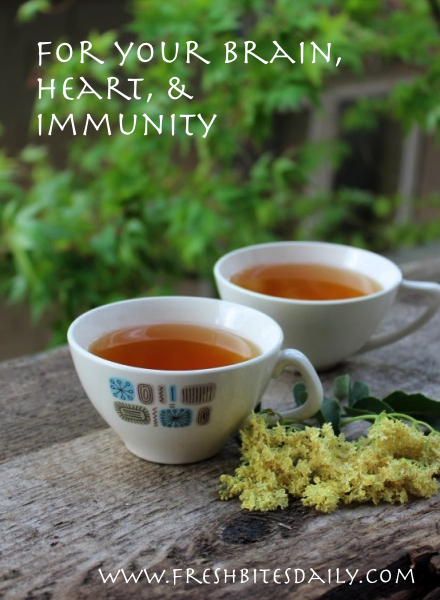 It turns out that nettle leaf completely kills his symptoms (read more here) and so we rely less on the elderflower but we have enough experience with the flower to feel like it is a health-supporting tea. Research suggests that it is the flavonoids in the flower that may support our immune system as we fight colds and flu and may also support our brain and heart health at the same time. Read more here. The tea is simple to make — like any other tea. Pour your hot water over your buds, cover, and let it steep for 10 minutes or even longer. Honey is a great sweetener option. 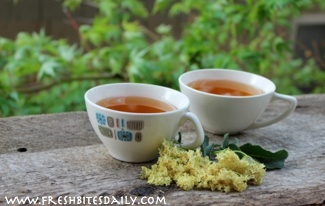 1 Comment on "Elderflower Tea to Nourish Your Brain, Heart, and Immune System"